Warmer weather, earlier sunrises, later sunsets, and of course, fresher, lighter fare. Spring is a wonderful time to start introducing salads back into your meal repertoire. By simply tossing in sweet potatoes, a light side salad can transform into a satisfying and healthy lunch or dinner. Not to mention, sweet potatoes are a great accompaniment to a wide range of salad flavor profiles from power greens to southwestern, sweet and fruity to zesty and spicy. 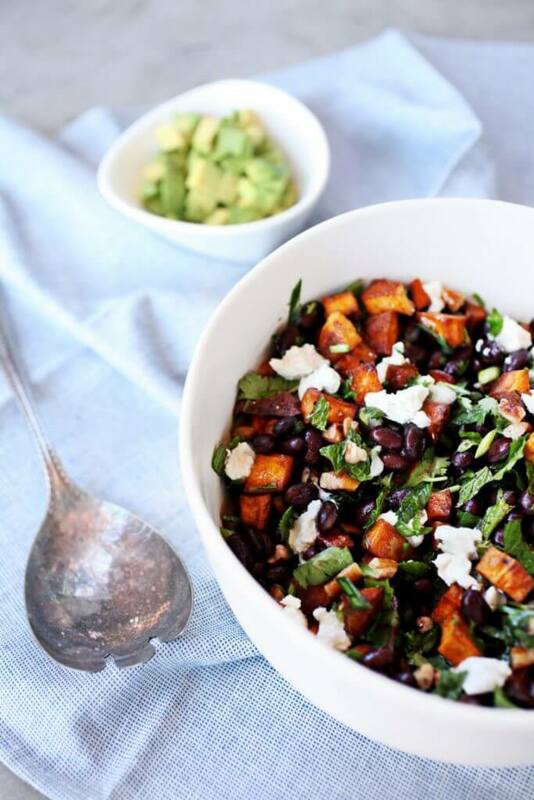 Sweet Potato & Black Bean Salad with Toasted Cumin Citronette – Created by Chef Vivian Howard, this bright salad is packed with flavor: cilantro, mint, goat cheese, pepitas, avocados, sweet taters and more all tossed in a zesty vinaigrette. Best part? Dice your ingredients up even smaller and you’ve got a delicious salsa for chips or tacos! 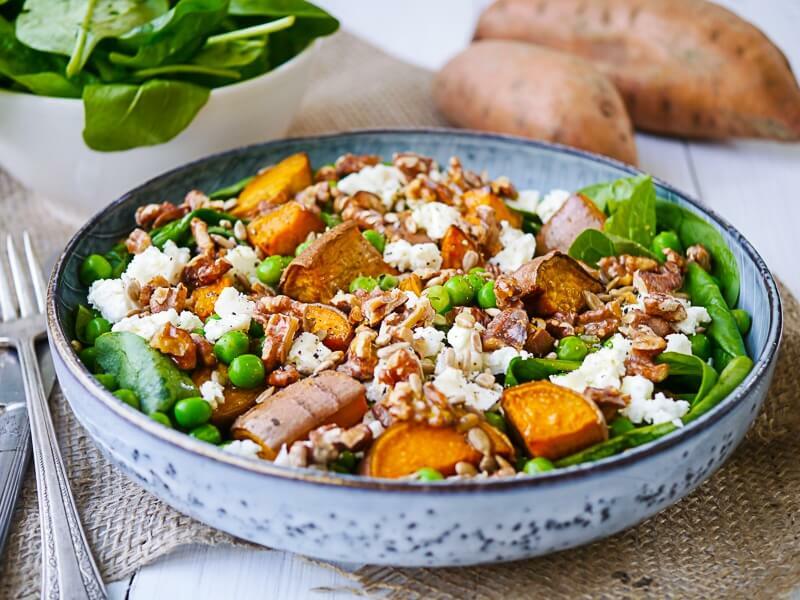 Sweet Potato, Pea and Feta Salad – If this salad isn’t the epitome of spring, then we don’t know what is! Nourish Everyday mixes spinach, roasted sweet potato, fresh peas, creamy feta and a sprinkle of crunchy nuts for one delightful salad. Bright and beautiful, this salad is a winner in our books! 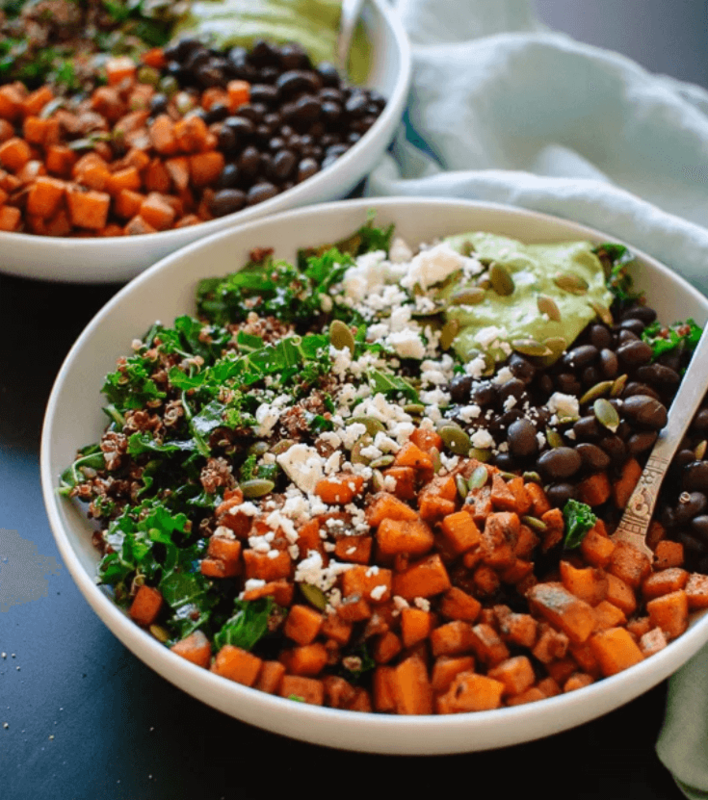 Southwestern Kale Power Salad with Sweet Potato, Quinoa & Avocado Sauce – Looking for a hearty salad that will deliver on nutrients too? Look no further. Cookie + Kate‘s power salad is the perfect blend of spicy sweet potatoes, crunchy kale, protein-packed black beans all drizzled with a creamy jalapeno avocado dressing. Yes, please! 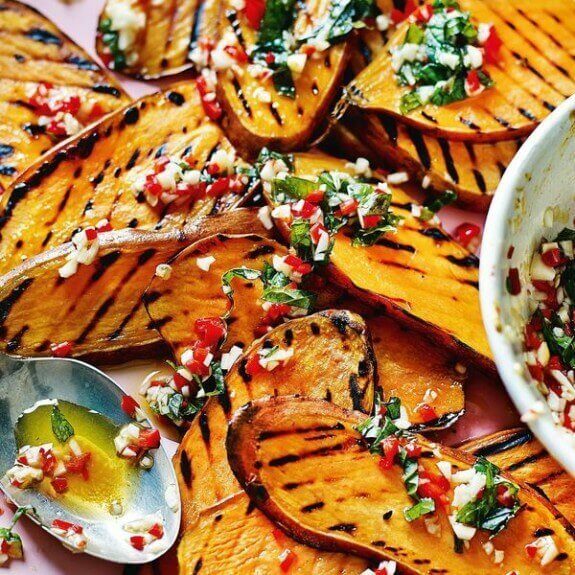 Griddled Sweet Potato, Mint and Chili Salad – Boy oh boy, we’re a huge fan of grilling sweet potatoes! Not only do they look beautiful all charred up, but they’re perfectly delicious too. Shared by The Happy Foodie from Shelina Permalloo’s “The Sunshine Diet,” these grilled sweet potato planks can be a great addition to any salad! 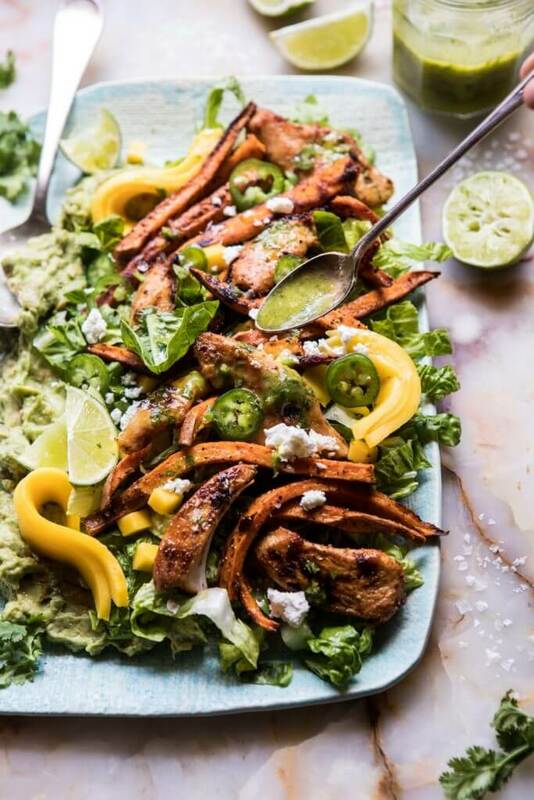 Chipotle Lime Chicken and Sweet Potato Salad with Jalapeño Vinaigrette – Yes, yes, yes. Half Baked Harvest outdoes herself with this salad combo! Chipotle chicken, matchstick sweet potatoes, avocado, fresh mango and a mouthwatering jalapeño vinaigrette makes this salad swoon worthy. Kale and Roasted Sweet Potato Salad – Celebrating Sweets takes a twist on a classic. 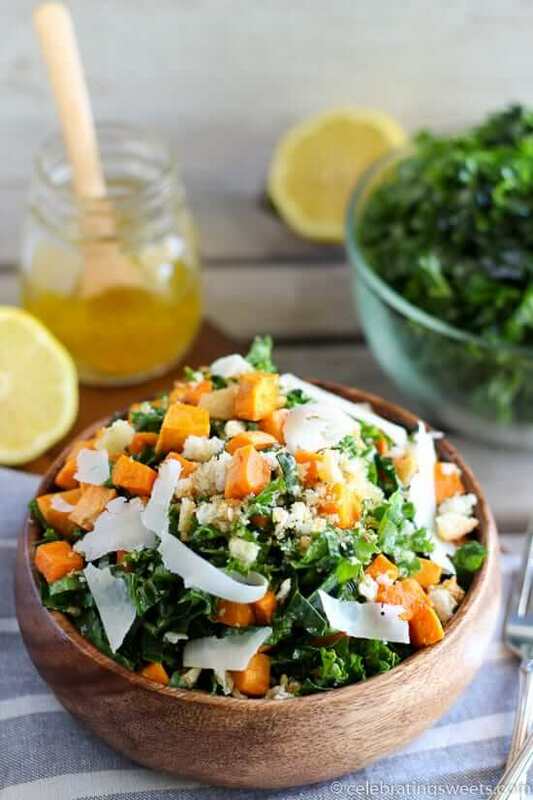 Crushed croutons, shaved parmesan, shredded kale and roasted sweet potatoes all tossed in a lemon-garlic vinaigrette. This sure is one salad to celebrate about! What’s your favorite sweet potato-inspired salad? Tag us on Instagram and you could be featured on our handle!